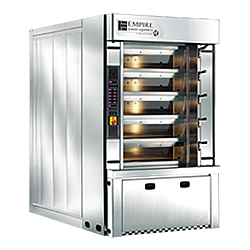 Our deck ovens provide numerous benefits from that of traditional revolving and traveling tray ovens. They bake so well, like brick ovens, because they are able to retain the heat. 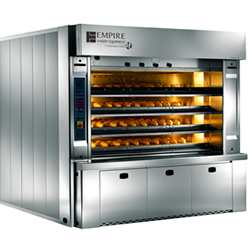 Even after steam is applied to a fully loaded chamber the oven is able to maintain the required temperature. 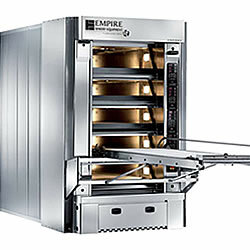 Empire’s vapor tube ovens are engineered to capitalize on this same technique. The advanced vapor tube technology is the secret that allows for heat distribution and retention. Vapor tubes deliver heat evenly throughout the product zone, with no fans or moving parts necessary to distribute the heat. 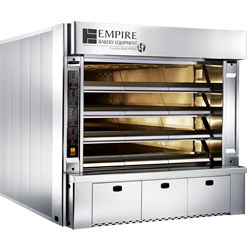 Without any damper or airflow adjustments the oven is able to provide consistent quality from front-to-back, side-to-side and deck-to-deck. In addition this removes the need for a steam boiler as each deck has it's own self-contained steam generator. Space Saving Design Featuring the ECO™ Energy Optimization System. Featuring the ECO™ Energy Optimization System..